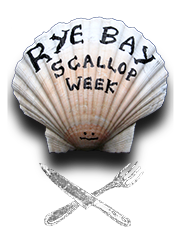 The 18th Rye Bay Scallop Week is scheduled for Saturday 22nd February – Sunday 1st March 2020. Rye Bay scallops are served in many restaurants in the area throughout the Scallop season so if you can’t wait for Rye Bay Scallop Week, contact the restaurants on this site to see if scallops are on the menu. Browse ingredients on the right to find scallop dishes to tantalise your taste buds. Don’t forget to book your restaurant or call before you arrive to avoid disappointment.